I enjoyed this comic series very much and enjoy humor such as this and the story to it too. Hard to believe that it ended in 2012. I wish i came across it sooner. I am eager and await for Dana’s return of Ozy and Millie. Will they return? I really hope so. The. are one of my favorite characters and comics! I hope you come back and do more soon. It’s been almost 3 years now. This is how we know just how beautiful this comic was. Years later we still come back. We now approach 7 years, with the odds of a continuation vanishingly remote. However, Dana has gone on to create new comics, such as Marigold Heavenly Nostrils (Phoebe and Her Unicorn to those newer here), which are worth the time to read. And yet, I find it hard to make the transition. This comic hit me the way a good book does, and it hurts to see it end. And now, it’s been 6.95 years! It really does hurt to see Ozy & Mille end! I found this webcomics few days ago, and I think its great! Please, come back to it! I would really want to see younger characters more mature (or, frankly, how they don’t grow up, despite their age). And you presented world problems in such funny way, too. Sooo can milly go bald every year now too? She already transferred the curse onto herself, remember? I discovered this a couple weeks ago and just now got through reading all the Ozzie and Millie comics from 1998 to 2008. The whole thing was really endearing and funny. Bravo. I have strong impression you were inspired in some sort by Moomin Troll? This series is AMAZING!!!!! I hope that you get back to it as soon as possible! I found this two or three days ago via Sandra and Woo, and I have to say it was absolutely beautiful in the time it took me to catch up. I was a little surprised when the adults started exhibiting lovelike behavior, considering I kinda liked the idea of the kids growing up like that, but I still don’t think it could have ended on a better note. Here’s hoping you end up coming back to us one day. This comic is older than I am. LOL! I thoroughly enjoyed it, your fan number will continue to grow, weither you are here or not. But still make more, pweese? Hard to believe its been over 4 years since the amazing end to Ozy and Millie. I remember reading this comic way back when it was still updating. Out of curiosity last week I decided to check for any updates and ended up re-reading the entire thing. 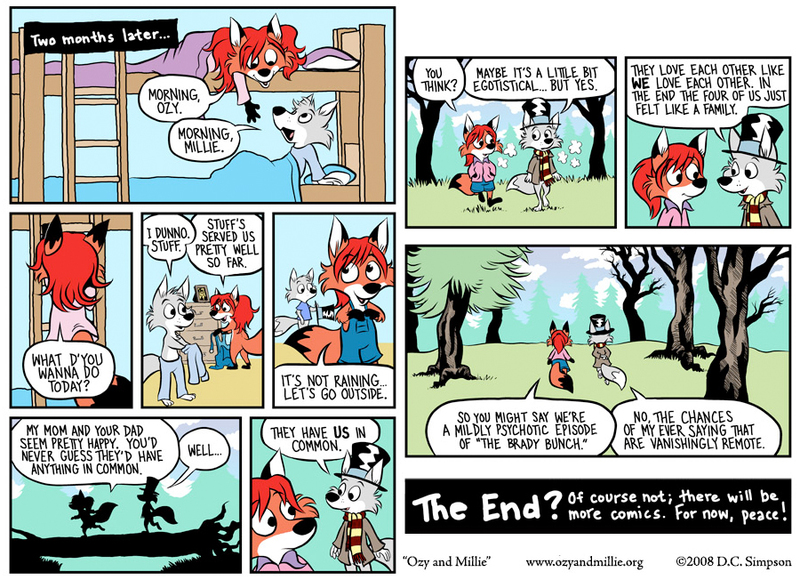 Ozy and Millie was a humorous, touching, intelligent and very well drawn comic. I absolutely loved every strip, and really wish there were more. However, I understand the need for an artist to move on and expand to grow and improve themselves and their work. Look forward to checking out Heavenly Nostrils when it launches and seeing how far your work has evolved. And maybe one day we can come back to Ozy and Millie together, as old friends. i discovered your comic 2 days ago, i am now late on my own comic. whoops. totally worth staying up for 38 or so hours straight. kinda sad it’s over now, it was a great read, i’m happy you gave it a real (but open ended) ending, and i do hope you come back to it, it’s a wonderful, and silly story, with quite a bit of inteligence strewn about. thank you for this wonderful read. This has been an awesome read, I’m actually kinda glad this one has an ending, it’s been long coming, and very satisfying to see through to fruition. I dare say I enjoyed it more than Calvin & Hobbes, despite some of the influence being draconically apparent :p.
I will be watching this space, it was a thrilling read. I discovered this strip through Sandra and Woo just a few days ago. I have spent those days going through the entire wonderful archive. I sincerely cannot believe that this strip was never syndicated! I am following Heavenly Nostrils and agree that it is cute, but this strip is awesome (to quote my kids) and I pray that you will return to it one day. There is a dearth of intelligent comics and you really need to provide this service. Love to you (and Ozy, Millie and the rest). Anyways, this is my second time reading every last strip of this, start to finish (not on one sitting, though I did get through a year or two’s worth in this one. Been up for about 6 hours). There’s something to like about all of these characters. If this got restarted, I’d follow it fervently. After having read “Heavenly Nostrils” for the past few months, I searched for other things you created, Dana, and I found “Ozy and Millie.” In the past couple of weeks, I’ve read them all and enjoyed them immensely. Thank you for giving us both of these worlds. And it’s good to know that the enjoyment of blowing bubbles (and feeling sad for them) is a universal constant! I really needed to read this comic throughout my years in middle and high school. I could totally relate to both characters, and I was really sad to see them go. I hope you’re happy now, and that you’ll revisit this world sometime in the future, even if it’s just sketches. Well, I am here to thank you basically, miss Dana. You have done a splendid job in those comic strips. The mixture of philosophy and emotions is just sweet. You have managed to achieve very accurately the feeling of the characters, and not only the uniqueness of Millie or the harmony of Ozy, but also delve inside the mind of Felicia and Avery for example, reflecting on the social pressure that kids all around the world go through and we more than often treat as “passage rites”, be them the cool kids or the marginalised nerds. I also loved the adult characters. I would not stop being amazed at how Millie`s mother managed to overcome EVERYTIME the smartness of the little tomboy fox. It has been a great pleasure to read all of your archive, and I hope you are well and healthy. Yes just finished reading all of it. I love the ending still sad its ending though. I can honestly say this has been my favorite webcomic. Hope i have a son and daughter like ozy and millie someday. Used to read this regularly years ago, and then stopped … I think during one of the long pauses. Couldn’t remember the name and have been searching for it ever since. Just found it again last week. Thanks for the story, Dana. Always loved it. i started reading this 3 days ago and i’m sad by the fact that it’s over…Come Back Millie!! i’ll miss you Ozy!! Well, this…. this made me think. Not only think, but feel… I miss it already, and I just finished it. It’s a fitting end, I think; I hope that other long-running webcomics can hope to end on a note like this. If the world ends tomorrow (which it won’t), I can honestly say that I’m glad I spent my last hours reading this. I just found this web comic a coupe of days ago, and I’m really glad I did. I’m still about 10 years behind, but I’m somewhat glad because it’s the kind of written work I don’t want to end. It’s cute, yet at the same time has deep philosophical concepts, and political messages I love. I really like the comics making fun of commercialism, but to pick just one aspect doesn’t really do justice to the work; they all work well together to form a thoroughly entertaining comic strip and story. If there’s one flaw it’s that the series ends, depriving us of more hilarious antics and entertaining portrayals of the world. Of course this comes from someone who has not read through to the end. It may be that it has a fitting end and to continue would strain it. I don’t know, I simply wish to express my approval of this. In any event, I can say from what limited exposure I have to Ozy and Milli that I would love to see more, and hope that the caption about how this is, of course, not the end it true. Thanks for the laughs! I recently finished reading through your comics. I just wanted to say they are awesome and I thoroughly enjoyed reading them. Thanks for the the deep thoughts, the social commentary, the relatable characters, the entertaining story lines, and of course the laughs! thank for this little dream you give to us, i read it all in 1 day; iwant to say hundred of think about this coming but i think that the only that really count is THANK YOU. I just finished the comic as its temporary end, I really like the story. It’s been a few years since the comic ended so I’m envisioning 2 things and those are Millie’s mom pregnant/with a new born fox/dragon hybrid and the kids as teenagers. Thank you, Dana. This comic, like all good things, had to come to an end, but it was a beautiful end, and it left possibilities open. Though like all endings, it is bittersweet: Ozy, Millie, and the rest of their spectacular world can go on exploring, playing, discovering, and above all having fun, but we won’t be able to watch, at least not for a while. But that’s okay, as watching isn’t the only way this improves our lives. In an introduction to Ender’s Game, Orson Scott Card said, amongst other things, “The “true” story is not the one the one that exists in my mind, it is CERTAINLY not the written words on the bound paper that you hold in your hands. The story in my mind is nothing but a hope; the text of a story is the tool I created in order to try to make that hope a reality. The story itself, the true story, is the one that the audience members create in their minds, guided and shaped by my text, but then transformed, elucidated, expanded, edited, and clarified by their own experience, their own desires, their own hopes and fears.” Ozy and Millie have certainly taught me new perspectives, and new ideas. Thank you, Dana, for enriching my world. I found this 2-3 days ago through Sandra and Woo, and read it all the way through in that time. I just found it so fantastic I couldn’t stop reading. It saddens me to know that there are no more comics for me to read, and there won’t be for some time. Regardless, I plan to come back and read through the archives a year from now, when they will seem fresh and new again. Thank you for the laughter, and the insight. I feel wiser than before having read this. Also, I totally plan to use “you can accept the existence of rain without denying the existence of umbrellas” in conversation at some point. It’s a fantastic line, so thanks for that one too. WHERE ARE THE NEW COMICS???? Unicorn thing updates but ozy and milly dosent!?!??!?!?!? Ozy and Millie ended almost 5 years ago. Heavenly Nostrils is her latest work. I know this has been gone for a long time, but I just want to thank you for those years of comics. I had been a fan for a long time, and everything about the comic, such as Millie and Ozy’s odd adventures, Llewellyn’s strange wisdom and sometimes ridiculous activities, Ms. Mudd’s clever battles of wits with her daughter, Avery’s hilarious brief-lived phases, Timulty’s randomness, and everything any of the teachers did, always made me laugh. Ozy and Millie is, undoubtedly, my favorite webcomic, and I’m glad to see that you continue to make great comics for Heavenly Nostrils. Really, there was not a single story without a strip that makes me break out laughing even on rereading. Thank you for everything. So… Ozy wears pants to bed but not outside? NEED MOAR!!! Please continue Ozy and Millie! Dana, I salute you for writing the best comic (in my opinion) strip I’ve ever read. I have to say most web comics start to fall apart in the end, characters become unfunny and especially become unclassic! This did not! I loved almost all of it. There were some spots I didn’t care for. A very few, don’t get me wrong, I love the crap out of this comic! I was surprised it, for me, became funnier over the years. I doubt it will be continued but I can sure hope. Too bad it’s over. I just read all the archives, and this was one of the greatest webcomics I’ve seen. WIll it ever continue? I first met this strip in 1998, when someone very dear to me introduced me to it. That person left my life shortly after, and from then till now, I didn’t touch Ozy and Millie because the memories hurt badly. FFWD a decade and change, and I just finished reading this last page. Thank you, Dana, for such a truly wonderful comic. FWIW, my #1 favorite was where you showed us Millie’s #1 dream. That one will forever stick with me. I love this comic! I only discovered it a few months ago, and it took me a long time to go through the archives, but the journey was worth it. I’m excited to start Heavenly Nostrils soon, and to see your art and writing progress. Well, I finished it…I liked it, a lot, & I’m, just kind of, sad that it’s ended. I hate when I get emotionally invested in things because I get this weird feeling in the Pit of my Stomach when it’s over, but I wouldn’t trade this slight discomfort for all the World, though I’m going to take it over anyway. I do hope the next time I stop by there might be something new, but if not, that’s Okay, I can live on Nostalgia. That said, Farwell. The feeling will always be attached to this comic, but we can regain the comic’s wondrous nature by re-reading it again and again. Your artwork in this comic is amazing, Dana. The quality of work you kept up throughout is frankly stunning. I REALLY, really hope to see more of them. You said there will be, so here’s to hoping. Thank you. This has been a wonderful comic. I had a dream a few weeks ago that these two were a bit older, about 15 or so, and having a philosophical conversation. It was almost as if nothing had changed, but it did feel different, and there were some changes, but…I stared and watched them. it was a nice dream. Once again, thank you, D.S.! This took me a few days, on and off, to get through. I am glad I did. This is probably the best comic I have ever read. Certainly the best to ever reach GoComics. Somehow, being able to leave my insignificant mark in the comments of this masterpiece is one of the things that I feel most glad I have done. It is works like this one that are truly magnificent. Ozy and Millie blends silliness, seriousness, and sentimentality in away that nothing else I have ever seen has. I can not possibly put into words how much this comic helps me when I am in a bad mood. Truly this is a work of art. Thank you, Dana, for your devotion to the creation of this wondrous comic. Ozy and Millie will always be in my heart. This page has rather become a guestbook page, and I felt I should leave a few words. I picked this up last year, and it’s taken me quite a while to read through it, but this is easily one of the highest quality comics I’ve read. My gratitude to the author, and to them I wish harmony. When the series continues, I will welcome it. Until then, I am content with what we have. I can imagine a tie-in to Heavenly Nostrils with an alternate-universe-with-anthromorphs-five-years-earlier-in-time, such that Dana doesn’t have to figure out how they look now. Phoebe and Marigold can come out of the other cushion in the couch. This comic will be with me forever. It truly shows human nature in all it’s forms, both good and bad. May it last till the end of time, for I believe that we all can learn something from the wondrous antics of Ozy, Milli, and the rest of there friends. Thank you, Ms. Simpson, for the beautiful story and lovable characters, and thank you, Orv, for your efforts in rebuilding this site and monitoring its health. The worst part about a great strip is seeing it end. But, that is the nature of things, I suppose. It’s been a great ride. While the ending wasn’t what I expected, it was a good one. 5 Years and 8 Days since its THE END??? I pray one day it will come back as funny and crazy out there as it was when it ended. Thank you, Dana, from the bottom of my heart. This comic has given me no small amount of joy in the past week, as I read it from beginning to end. The characters have become far dearer to me than I ever expected could happen from a comic strip – indeed from any work of fiction whatsoever. I hope to return and re-read it many times. Also thank you to Orv, for keeping the site going and the discussion civil, and to all the people who accompanied me through the whole comic in the comments, even if I missed most of you by several months. I hope that I might have made the journey a little less lonely too for those who come after me, through my small contributions to the discourse. Until we meet again, my dear furry and scaly friends. May your adventures forever live on, in this end of not-ending. Whisper-quiet, and everything in those words that made this comic so grand throughout its run. A perfect ending, then. And, like the rest of the comic, well worthy of remembrance. I could have sworn there was a strip at the end showing some roughly college-age character designs… Maybe I imagined that. It does exist; it was apparently a ‘what-if’ that Dana had drawn and posted elsewhere, which was linked to in the comments of one of the strips. Unfortunately I don’t have the link, nor can I remember which strip it was linked from. Feel free to go back and look! The thought of this comic not continuing literally made me cry, but I can see how it would be hard to pick up after years of not thinking about these characters… Thank you for sharing such a wonderful world with us all. This has been a wonderful experience. I enjoyed reading every last strip since I started. I appreciate even more your dedication to the strip and your constant effort. You’re a great inspiration, Dana. This is my third trip through, and it’s beautiful every time. I so very much wish you would write the comic-book format stories of them at an older age that you once suggested as a possibility, because I’d like to see them grow. But regardless, thank you for this story. Three years later and we’re still going back and rereading this. This is my third or fourth read-through, and never once did I say where I found this. Upon my previous year of high school, to every single student was an iPad given. I was rather prone to using it excessively, despite there being many things blocked by their network, and I started to read a lot of stuff on TVTropes, where I happened to discover Ozy and Millie by pure chance. I kept pressing the “random page” button on their website, and I eventually found this. And despite the fact that I disapproved of the iPads we have been given, I may never have found this comic in the first place if we hadn’t. And now, I am currently completing my final year of high school, before I go on to Purdue University to study chemistry, computer engineering, meteorology, and maybe computer-aided design. And with that note, see ya’ll later. I’m done for now, because I have many important things to do. However, be assured that I will return. The charm, beauty, and subject matter of this webcomic will surely bring me back, sometime. And maybe, when I return, there will be more. Ya never know, I guess. Even if they’re so last year. Thank You Dana, for Your astonishing work, and for entertaining us all, giving me reasons to laugh, but also giving me reasons to think – about life and world in general. As once Llewellyn said, “if You focus on destination, You will miss the journey” – Ozy and Millie gave me an amazing trip while reading it from start to here, I am so glad I found them, and I am glad the last (for now) strip is just like it is. I really enjoy the characters You created, love their purity and actual intelligence, the way they see the world, and all that nonsense and absurd present in the comic, all these references to culture and society. Thank You for over two thousand strips filled with laughter, joy, friendship and love. I love it so much. And thank You Orv, for managing this page, so we can read it all, and keeping the discussion here “high-leveled”. Dziękuję, Dana, za wspaniałą podróż z Ozy’m i Millie, za te dwa tysiące stron wypełnionych szaleństwem, radością, śmiechem, przyjaźnią, miłością, ale też poważnymi przecież przemyśleniami, odważnym spojrzeniem na świat, oraz Twoim własnym życiem, ujętym w tą opowieść. Twoja praca wprawiała mnie w doskonały nastrój, za każdym razem, gdy ją widziałem, i ciesze się, że ten ostatni (jak na razie) kawałek jest taki, jaki jest. Tobie Orv dziękuję za prowadzenie tej strony, segregowanie tej masy komiksów i komentarzy, oraz utrzymywanie w ryzach konwersacji. Wrócę tu swego czasu, aby ponownie odbyć tę jedną z najlepszych podróży mego życia. Wait, where’s the continuation? I must have more Ozy and Millie! Seven years later I’m still wondering whether by “more will be coming” refers to Phoebe and Her Unicorn or if Ozy and Millie will be coming back. Phoebe is funny, but I just can’t relate to it. Millie was priceless. Now after going through the entire archive, I’ve put Ozy and Millie up with Calvin and Hobbes, Bloom County and Frazz as my favorite strips all time. I don’t know whether you’ve moved on from Ozy and Millie for good or not, but thank you for all the priceless laughs, Dana. Thank you Dana for all your effort in bringing this webcomic to life. I enjoyed reading it. Thank You, love. This was, is, and will always be my favorite comic, web or otherwise. Know that if you ever revive your beautiful creations, we’ll be here, loving every strip. Thank you, Dana, for shaping my childhood. Ozy’s smarts and Millie’s antics helped me become who I am today, and for that, I thank you. Love the comic and have probably reread it like I don’t even remember how many times. But is it just me or was the last line changed. It used to be something like “no I would never say that”? I really enjoyed this comic but will this comic ever get going again? I would really love to see more of Ozy and Millie. This marks the end of my third read-through of this comic. The first was when I first got out of my parents’ house and finally discovered the Internet in 2006. The second pulled me out of a low spot during college in 2011. And this read lifted my spirits during frustrating professional work. So when I’m frustrated again by life’s troubles in 2020, I’ll be back again. Thanks for the labor of love, Dana. Let’s see. It’s been 7 years since this comic ended. Ozy and Millie are now 17 y.o. Will we see them as adults in a short series in a couple of years, either as a married couple or just living together? I WANT MORE OZY & MILLIE!!! I do hope that she brings this back, it is very cute at times and very thoughtful, kind of like Calvin and Hobbes was for our parents or grandparents generation (no offense of course). two paws or wings or hands up (species depending). Thank you for this comic. I understand why you stopped; an artist is their worst critic, and many artists want to be known for many things. If you only had Ozy and Millie, you’d feel unaccomplished and empty, despite everyone else feeling the opposite. I respect your choice, and I thank you for making this comic because you got me through my senior year of high school. I wish you luck on the rest of your endeavors, Mrs. Simpson. We weep, bid farewell, move on. But the day when one ozy and millie strip gets released its going to feel so special and at the same time nostalgic…. I don’t have anything to say that hasn’t been said dozens of times before, in every form I could think of. Ozy and Millie went from something I’d heard mentioned once or twice to being my favorite comic. I read through all ten years of comics in… what, two? three? days of “forgetting” to sleep until late became early, and the only thing I could want from this is more of the same. Thanks so much for a decade of the best comic there is, and here’s to hoping for more. As said before by a lot of more fortunate people that found this comic way, way before I did, this has to be one of the best webcomics I’ve ever read. It has everything and in a relatable way. maybe because the Internet is, first and foremost, the realm of dorky kids? and probably most of us were dorky kids at school? awkward teens in highschool? who knows; but I do feel missing out on this great piece of work and only finding about it a lot of years after it finished. A part of me wishes for a “second season” with older Ozy and Millie, but it probably won’t be the same. As Miguel de Unamuno once said “when the author kills a character, who can resurrect it?” (not sure if that’s the exact quote but the idea stays) “Ozy and Millie” was a part of Dana’s life, and our life too, and will remain so, but no longer a main part, rather a fond memory, that thanks to the internet we can always reread and enjoy once again. This is a fun comic I read. One day I hope to see this as an excellent movie. Haaaaa… Third time reading the entire comic series from the very first to the very last….and I still get a little choked up. God I wish we had more of this….I miss Millie and Ozy. Amazing comic for sure! Even better the older you get. This comic makes my heart happy. Thanks for that. My third time too, and the first time I’ve read all the comments (including all of these). What can I possibly say that one of you other afficiandos hasn’t already said better than I could? Dana, thank you for sharing your wit and insight; Orv, thank you for making this site possible; the rest of you, thank you for being fellow travelers through this amazing universe. Oh, and I really like the real fox-type teeth. Onward to the fourth readings! PS: Orv, maybe this page needs to be made bigger, I almost couldn’t get the “Post Comment” button onto my screen. NOO ITS OVER!! I thinks. I wus both hoping to reach the end and not to at the same time, I knew it wus coming but not this fast! It’s been 10 years since this strip wow! Who knew that a random YouTube search for wut is a furry could bring me here!? Great comic, best I’ve read. Sorry your post took so long to show up. I have to manually approve posts from new accounts, and between travel and a massive Russian spam run against the site, I got a bit behind. Am I the only one who noticed that Ozy apparently only likes to wear pants to bed? I have finished my first read-through of this brilliant comic. So wonderfully timeless it is, that it can still be enjoyed in its entirety even now. I hope very much for a continuation.